I went for a slalom session at Harefield west of London today, meeting up with Craig Ayres.It was the first time I’d paddled with Craig for about six weeks, and it was good to be on the water with him again.We did a couple of courses between 30 and 40 seconds long, with about 8 runs on each.It got me thinking about what’s different for me as a slalom paddler now, compared to when it was my main pursuit through the 80’s when I was in my 20’s. 1.I’m nowhere near as single-minded now.I now fit my training in as and when I can around my work and family commitments, which means I don’t train as often or as long as I used to, or get to every race I could. If I can do something (gym, run, bike, stretching and core exercises or paddle) every day I’m doing very well– but that sort of consistency is hard to maintain. I remember my sister giving me some very straight feedback in the early 80’s when I was making my first serious attempt at slalom; “you’ve become a selfish b****”.I was a bit shocked at the time, but I think she was right. And I’ve seen since then that it’s necessary. If you’re really serious, training and racing has to be your number 1 priority.And there’s a cost to that. 2.I’m not as fast as I used to be.This is blindingly obvious, but it plays out in different ways. I simply can’t get my body to respond with the speed or intensity it used to.It takes longer to recover after a hard session. The window for fast learning seems to be gone,so it’s frustrating (but still a good challenge) to try to learn new technique. 3.It’s enjoyable in a different way now. I don’t remember always enjoying training in my 20’s the way I do now.I was stressed if a session went badly, or if I wasn’t fast enough compared to my training partners, or if I didn’t manage to fit in every session I planned.Now, I’m grateful for any training I manage to do, and even if I feel tired or distracted beforehand I invariably feel emotionally re-charged after a decent work-out. This is the positive ‘flip-side’ about competitive sport not being the central part of my life anymore, it gives me a bigger perspective. 4.I’m still learning. I used to plan my training meticulously and keep a detailed training diary.I pretty make it up as I go along now, taking it week by week to determine what’s possible and what sessions will be most relevant.On reflection, I think I’m missing a trick by not keeping better records now, and making sure I’m making the most of my limited training time. I set myself the goal of doing five slalom races this year in Div 1, then taking stock.I’ve managed only two so far, so there’s three to do between now and October. So I need to be a bit smarter about what will really make the biggest difference to my performance. 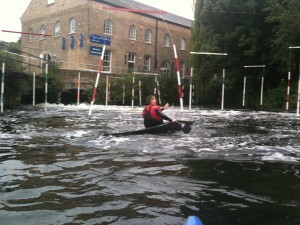 Nice blog mally,good to be back on the water with you. Training! You are making me feel bad for enjoying a few days off from rafting and boating every day at LV. All I have managed so far today is a few pints at the Lytton… carbo loading… ) Still, got an informal canoe polo session at Ware Lock tonight to look forward to. « Top after-work paddling locations?